"Late August, given heavy rain and sun..."
Seamus Heaney was born in Northern Ireland in 1939. His earliest years were spent on his parents' 50-acre farm in County Derry. At the age of 12, Heaney earned a scholarship to a Catholic boarding school some 40 miles away from the family farm. That move from his rural upbringing would be the first of many in Heaney's life, with each relocation taking him farther from his birthplace. Still, despite his distance from County Derry, Heaney never lost touch with his roots, and much of his poetry recaptures the look, feel, and smell of those formative years. A fragile childlike hope also finds its way into many of Heaney's poems. Scholar William Corbett once said, "His refusal to part with hope—the word of his childhood—becomes the positive tang of his poetry." This undying hope can be heard and felt in "Blackberry Picking," a poem from the collection Death of a Naturalist, first published in 1966. In the poem, Heaney describes how each summer he is seduced by blackberries, and how each summer he collects too many, only to see the majority spoil. Like so many of Heaney's poems, it carries a message of innocent exuberance that is both tragic and uplifting. Among Heaney's many honors are the Nobel Prize for Literature (1995) and the Whitbread Prize. He currently lives in Dublin, Ireland. 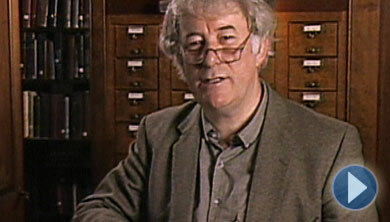 Seamus Heaney's reading is part of the WGBH series POETRY BREAKS created by Leita Luchetti. To read this and other poems and translations by Seamus Heaney, as well as biographical information about the poet, please visit the Poetry Foundation Web site.